The Foundation Library Development Indonesia was established in 2004 after the library of the Christian University of Indonesia in the Moluccas (UKIM) in Ambon lost all its books because of a completely irresponsible act of arson. Since then we have sent thousands of English language academic books to UKIM and also to other universities and colleges that are in need of academic books for study and research by students and staff. We have helped university libraries in Ambon, Jayapura, Jakarta, Tomohon, Banjermasin and Kupang. 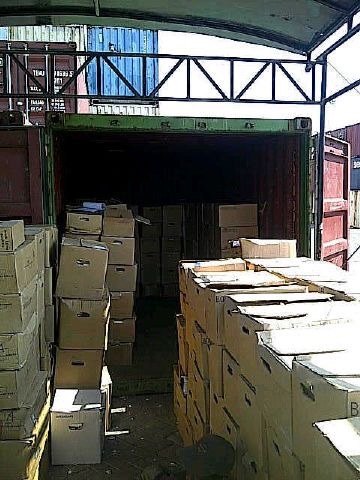 In the beginning of 2015 the Foundation was able to send over 22,000 scientific books in one large 20ft container to Ambon, which the Foundation bought for the purpose. These books were acquired from the university library of the Protestant Theological University in Kampen, the Netherlands, which had to close down. The 20ft Container arrived on Monday 20 April 2015 in the port of Surabaya. It still waits for a few documents needed to import the books. UKIM Ambon, the beneficiary, is now, with the help of the Indonesian Community of Churches (the PGI) in Jakarta, actively engaged to get all the necessary documents from the relevant authorities. 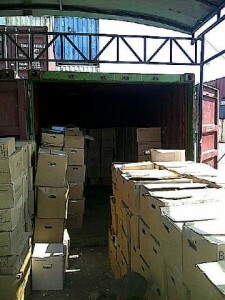 In November 2015 the Customs in the Port of Surabaya opened the container, as all the complicated paper work was done, and they began inspecting the contents. This was the last stage in the forwarding of the books to the Christian University in Ambon, where these books are desperately needed. On 30 November 2015 the Container reached the port of Ambon. Shortly thereafter the Container, together with all the books, was transported to the campus of the University. This was, by far, our biggest project. We are very grateful, that in the end, all the books arrived safely at their destination for use by staff and students of the Christian University of Indonesia in Ambon (UKIM).